I know you’re thinking why not just make the baby food and either use it or freeze it, but I’m ahead of you on that one! Here’s why you would want some dehydrated baby food. For taking along when baby goes for their backpacking adventure (you know carrying the baby in the baby-backpack is heavy enough–you don’t need all that baby food weighing you down more). For using on any trip where packing space is limited, but water is accessible. For baby’s emergency kit. For your food storage if you might have a baby coming to stay from the extended family. Because it has a long shelf life so you can get a head start on baby food storage when you have a million carrots now, but the baby won’t be eating solid foods until NEXT fall. So now that I’ve got you convinced that you need some dehydrated baby food, here’s how to make some. Pick a vegetable. I did carrots. I know, you’re surprised by that one–I’m still trying to clear that cooler of carrots out of my kitchen. This would probably work with fruit as well, but I haven’t tried a fruit yet. It might get sticky in the blender, but might be fine. I’ll have to try some next time I’ve got excess fruit. Wash and prep your food–peel it, core it, whatever you would normally do to preserve that particular veggie. I scrubbed the carrots clean, cut the tops and bottoms off, and cut them in half the long way so they’d cook faster. Put the veggie in a pot with some water and cook it or steam it until it’s soft. Then put the soft veggie in your blender or food processor and blend it to mush. You may need to add some of the water it cooked in back into it to get a pour-able consistency. Now prep your dehydrator trays as if for fruit leather. I’ve found if I don’t need the whole tray space, I can run one length of plastic wrap down the middle of my trays and over the edge. Then when I put it in the dehydrator, I put the non-wrapped edges in the tray grooves and it slides in nice and smooth. You still get a lot of drying area on one length of plastic wrap. Pour your blended veggie on the tray like for fruit leather. You can go a bit thicker with the veggies. Some vegetables may not need to be blended first, but I know carrots dry hard and I don’t want to put my food processor or blender through the task of trying to chop dried carrots into a powder, so I blended it first and then blended it again after it was dry. 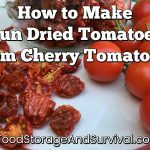 Once you’ve got it in the dehydrator, dry it until it’s crispy. So that it snaps when you take it off the trays and bend it. Veggies don’t stick together like fruits, so they look kind of crazy on the plastic when they’re dried. Blend it until it’s a nice fine powder. It might take a while. Now you have powdered baby food! Store it or pack it or use it. I’ll be getting some of this in my baby emergency kit next spring. It is highly concentrated–that half a sandwich bag was the whole pot of carrots! To reconstitute, I heated up 1/8 cup water and added 1 1/2 tsp of the carrot powder to it. Proportion this to how much your baby eats, so 1/4 cup water to approx 1 TB of carrot powder. It rehydrated very quickly, but I let it sit with the lid on for a minute or so just to make sure it was all soft. It was a bit on the thick side, you might want to add a little more water or a little less powder depending on baby’s tastes. Yummy instant carrot baby food. Organic from my own garden and man does it not take much space on my shelf! Not too hard, right? I’m doing squash next since I still have a bunch of winter squash that is hanging out in my living room as fall decor, but now it’s December and I don’t have enough Santa hats to make them into Christmas decor, so I guess I need to cook a few of them up. Squash powder would be a great way to make them smaller, NOT use my freezer space for more squash, and have them around when I’m needing baby food next fall! I wonder if you could do the same thing with potatos, but make a home version of instant potato flakes? Have I missed out on something??? Maybe I've not been paying attention while reading your posts… Are you expecting? If so, congratulations!! I sneak veggies into all kinds of dishes by powdering them… The older our boys have gotten the more picky they have become. They still eat what I cook but they would prefer pizza at almost every meal. So in order to get in more nutrition, I use veggie powders! Morgan-Maybe could do potatoes. I don't see why not. They get quite hard with drying also, so you'd want to go the same method of blend, dry the mush, then blend again. It would be worth a try. Peggy–:) It hasn't been generally announced on the blog. Totally not planned, but the kids are thrilled about it and I'm adjusting to the idea of being a mommy of a little one again. Should be fun. I dehydrated some pureed pumpkin last fall and was wondering how I would ever use it, but I put some in some stew I made – worked great. Helped thicken it a bit too. That is genius! I can't wait to try it out! Thanks for the idea and great directions. oh my gosh, this is amazing! you are so bomb diggity for sharing this. Um, this is the coolest thing I have ever seen. serious. And yes, this is such a great idea!! If we can kill the awful slugs next year and get a better yield of carrots, I would love to try this. I love how game you are to try stuff like this. Thank you! When my daughter was an infant (25 years ago), my mother send me commerical dehydrated baby food. Not sure the brand, but was just telling pregnant daughter that was what she ate when we were stationed overseas. No glass to break and traveled really easy. Simple idea, thanks for posting. I’m going to make some for her.